At moments of crisis, we turn to our faith; at least, that’s what lots of people assumed when church attendance briefly spiked after the September 11 attacks. This was the logic behind my looking for instances of the word “religion” in newspapers in May, 1775. I’m curious how newspaper writers invoked religion, and I also want to know what they connected it to. Was it a specific kind of religion? 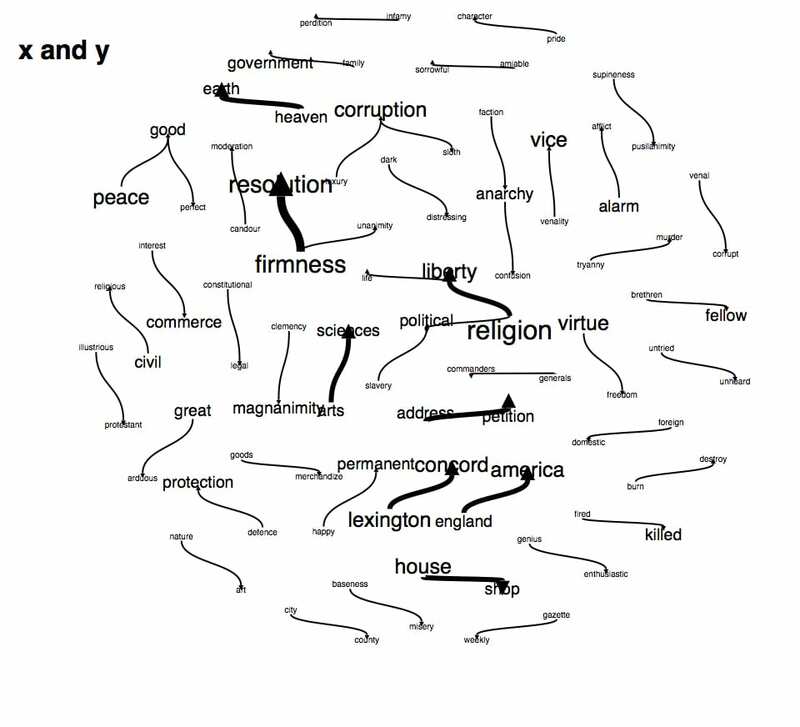 The visualization above focuses on pairs of words joined by “and.” It thus looks inherently at linkages, at the embedding of ideas with one another. Roughly down the middle are the terms that came up the most frequently, around the edges are the less frequent terms. The first thing that jumps out at me is that the word “religion” is so closely linked to “liberty,” which is then tied to “life.” One can’t help but hear “life, liberty, and the pursuit of happiness,” even if this is a year too early for the Declaration of Independence. The most powerful link, however, is between firmness and resolution, connected to unanimity. This was a people, when it talked about faith, that also talked about standing together firmly and resolutely. Sounds like a people at war. 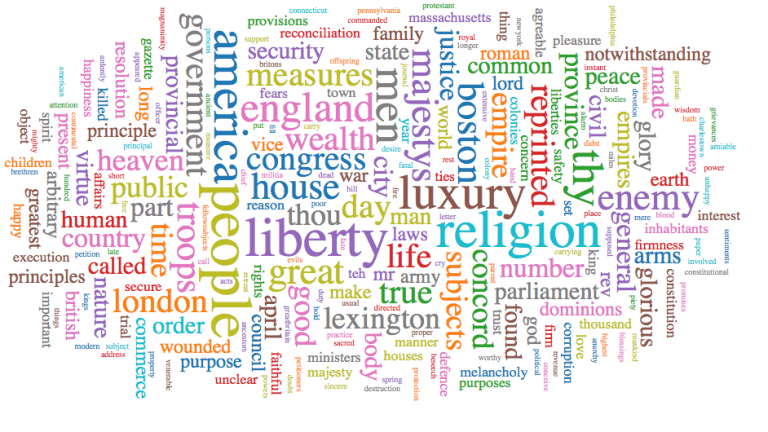 Unsurprisingly, some of the largest pairings beyond those already discussed are Lexington to Concord, England to America, and address to petition. So what does this visualization, based on the word “religion,” tell us about the moment that Americans realized that Great Britain, the most powerful military in the world, had taken up arms against them? At a highly charged political moment of great crisis, “religion” came to serve politics and political ends. Before making too many assumptions about what this means more generally, however, there is important counter data that suggests a much more complicated story. The raw numbers of newspaper articles in America’s Historical Newspapers for the period between May 1 and June 1, 1775 are interesting. There are lots of problems with these searches, not least that they is based on very shaky OCR. However, they do suggest that newspaper writers felt a great deal more confidence speaking of God and Providence than they did of “religion,” a supposition that is worthy of further investigation.